Not at all loath to post something done years ago that is still relevant today, 2020 Vision – Connections is a little project I did with fellow architects Mark Barron and Richard Sellars some years ago. With the ongoing debate on the future of transport and urban response in our cities I thought this poster still aptly conveys my thoughts on the importance local authorities should be placing on walking, cycling and public transport in and around our cities. 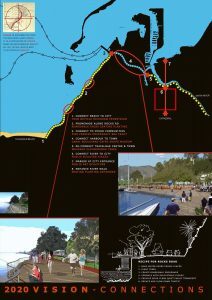 In this case we looked at how Tahunanui beach could be connected to central Nelson. 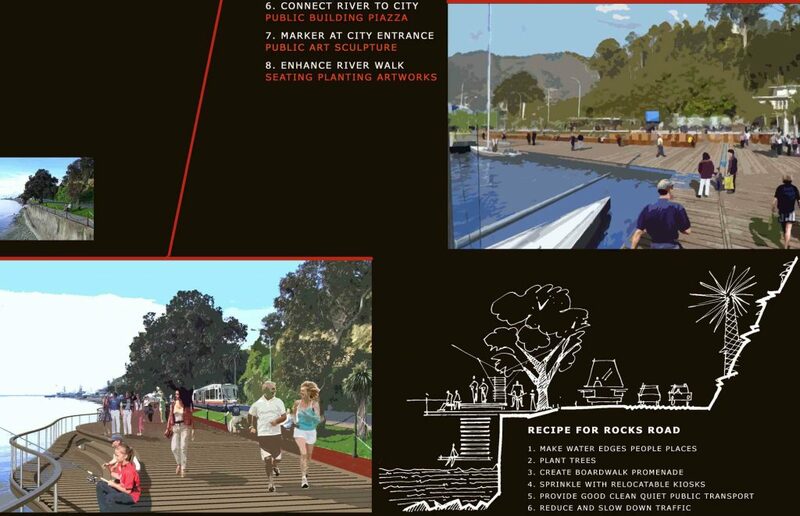 This recipe for Rocks Rd doesn’t focus on shifting a problem elsewhere, rather it focuses on building in an alternative. IE allowing a shift in personal transport modes by creating better choices. Building a large undulating shared pathway/boardwalk for walking and cycling out over the sea edge, and creating room for a tram style public transport. And it might just make the place more beautiful at the same time.